It’s true. Recruiters from both private businesses and recruiting agencies scour LinkedIn all the time to find business professionals passively or actively seeking work. Job boards like Monster and Career Builder are great, but what you may not know is that many high end recruiters use LinkedIn to find the best of the best. The job boards are sometimes full of actively seeking candidates which can be a little overwhelming to some recruiters. LinkedIn allows a recruiter to work at the pace of their open orders and take their time to find the candidates they are looking for. Let’s get one thing straight. If you are in business, you need to be on LinkedIn. This is also true if you want to be in business. Meaning, if you are in school… now is the PERFECT time to get started on LinkedIn. 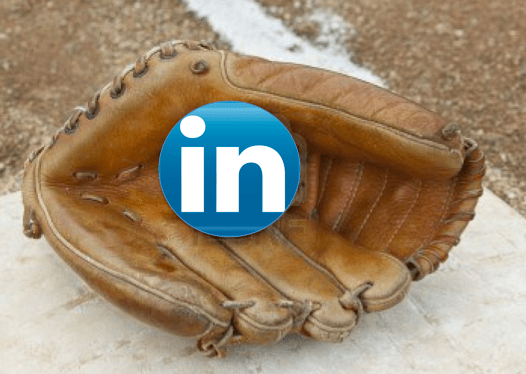 Keeping your LinkedIn profile active is a lot like keeping a baseball glove worn-in and ready to use. When I was growing up playing baseball, my dad always told me to oil up my glove and use it regularly. Otherwise, it would get stiff and make it hard to catch fly balls and grounders. Catching these fly balls and grounders would be critical in a game to maintain the favor and friendship of my teammates! Little did I know my dad was teaching me a LinkedIn lesson in the 1970′s! Contributor William Arruda gave Forbes readers good reasons last week to give LinkedIn a much more serious look in 2014. Now that Arruda has covered the “why” of updating your profile, I’d like to take a closer look at the “how.” So I’ve reconnected with Wayne Breitbarth, the LinkedIn consultant and author behind the LinkedIn user research in the Forbes Most Read article I presented last month. Whether you’re a power user or a casual LinkedIn participant so far, here are the 14 straightforward things Wayne suggested to me that are within the reach of every one of us as we bring the current business year to a close. Practice the ongoing steps and by the time the New Year arrives, you can have them committed to a habit you can conduct in just 10 minutes a day, if possible. But even 1-2 times a week could put you well ahead of the typical curve. 1. Update your photo. Your picture should be recent, professional, and recognizable. An extra tip from Contributor Ken Krogue: Make the photo black and white—since the majority of the photos are in color, the black and white choice will help to set you apart from the crowd. 2. Craft a killer Headline. These are the most important 120 characters on your profile and should include your most important keywords and a short version of your branding story or elevator speech. 3. Revisit your Summary. Think of a tone and style akin to having a cup of coffee with the people who visit your profile. Your description should make them want to pursue a lasting business relationship with you. Would you want to know the person you see in your description, or do you sound entirely self-focused? Now’s the time to give it a bit of thought. 4. Insert a call to action in your profile. Don’t assume readers of your profile know what to do next to find out more about you and your products or services. Be specific and share a link or document that will help them move another step closer to a meeting, phone call, or request to connect on LinkedIn. 5. Join 50 groups. Well, consider at least joining 10. With more than 1.8 million to choose from, you have the opportunity to increase your relevancy, find new people to join your network, and send direct messages to thousands of people who are not in your direct network. To avoid “email overload,” adjust each group’s contact settings to your liking. Thankfully, for me, there is only one Thea Newcomb! (Accept no substitutes). 3. People are researching you. All kinds of people use all kinds of ways to learn about you. LinkedIn gives you an opportunity to control what they discover about your strengths and, more important, about your brand. Who are these people? People you know. People who want to know you. People who matter: Your prospects, employees, manager, clients, competitors. They all use LinkedIn to learn about others. They search for you before meeting you for the first time, or after reading an article that you were featured in, or when deciding whether to respond to your email. 4. It’s packed with invaluable resources. LinkedIn helps you expand your success by offering crucial connections and expertise. Need to source staff? Want to solve problems that can’t be solved by the people in your company? Need to open doors with clients or partners? Need a service provider referral? Want to research what the competition is doing? Need to see who’s in a prospective client’s network? LinkedIn puts all of these assets at your fingertips.